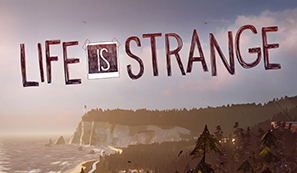 Life is Strange: Chrysalis contains wonderfully composed shots and moments against a relaxing soundtrack that makes the player feel comfortable in its world. As the first part in a five episode-long story it does a great job of both having its own narrative arc and setting up the overall plot. While it does have its issues – especially in some of the writing – this is an experience that will leave you wanting more. 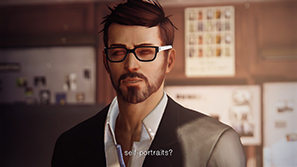 You play as Max Crawford, a photography student that has returned to her hometown in order to conclude her education. In the years she's been gone many things have changed and the awkward feeling of settling in somewhere new, yet familiar is upon her. On top of this she suddenly finds she has a unique and powerful ability; to rewind time. The game starts off dramatically. You find yourself in a forest path on the coast leading to a lighthouse. There is a heavy storm around you and you're unsure where you are and how you got there. Following the path reveals an enormous tornado over the sea, sending a boat flying into the lighthouse. Then Max suddenly wakes up midway through a lecture. This is the type of intro that immediately grabs your attention. Chrysalis gameplay feels much like a more relaxed Telltale game. You walk around (or jog) and look at things and talk to people. There are no quicktime events and only a few puzzle sections. However, the time rewinding mechanic introduced in this game is an intriguing addition to the genre. Of course, the power is initially used to prevent a horrible scenario from playing out. Max witnesses something and that triggers the discovery of this ability. Aside from this use, there are a couple ways of utilising this unique skill to manipulate the game for yourself. Max remembers what she experienced before rewinding time so if you discover something but leave evidence of your presence you can rewind so everything is as it was but you still know. You can also rewind through conversations in which you make dialogue choices. This both makes the choices you initially make feel unimportant but yourself powerful as you have access to any option you want in any conversation. 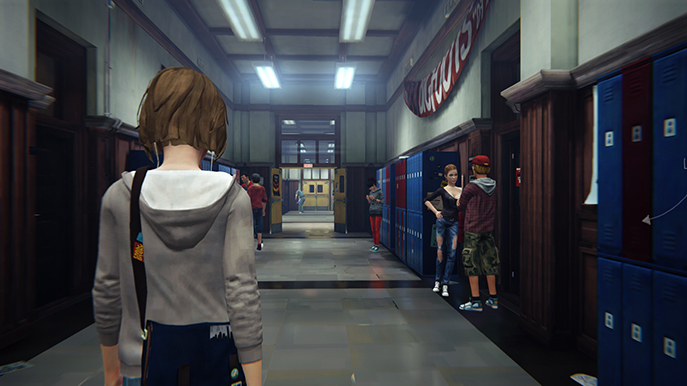 A game like this lives and dies on its writing and Life is Strange is tremendously inconsistent. Like Dontnod's previous game – Remember Me – there is a certain arrogance to some of the characters. For instance: early on in the game you are in a photography lecture. The lecturer is supposedly renowned as a figure in the industry and throughout the game there are references to people respecting, admiring and knowing him. However, there is a problem with this. This lecturer has no established foundations in the game for this status; other than what other people say. The scene that introduces you to him is full of nonsense words and tedious moments. As a photography graduate I found it immensely frustrating having to listening to that scene and that I wasn't given the option of answering the questions correctly as I knew the answers; but that's probably just me. I hated that entire scene. There are other characters too that just feel like lazy types: the horrible girl that leads her own group of friends, the jocks, the over-zealous security guard, the uncaring principle. Some of the dialogue is very poor as well. 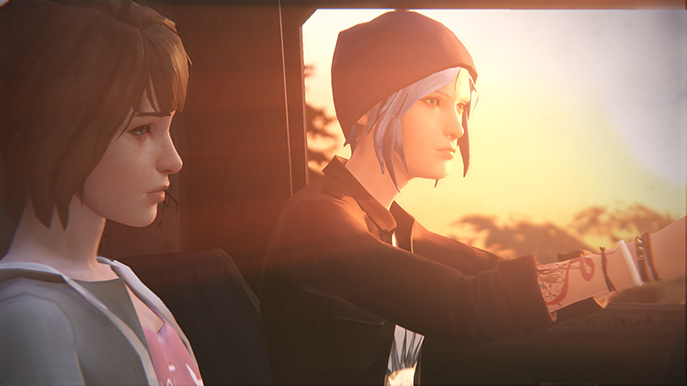 Fortunately, the two characters that really matter are very well written; Max and Chloe. Max feels like a well rounded character. 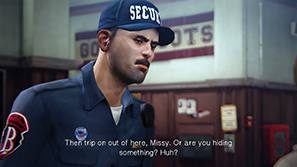 Dontnod have done a great job of inserting contextualising moments regarding her character into the game without losing focus on the current narrative. There are so many objects and people that you can 'look' at; initialising Max's inner monologue as she thinks her opinion on the subject. Listening to Max's thoughts allow you to be certain of her motif, rather than being unsure after she behaves differently with different people. 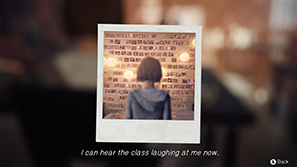 Chloe is Max's good friend from before she moved to collage and is the catalyst for the game getting really interesting. You meet her half way through the episode and I was a little underwhelmed until then. It feels like a lot more consideration went into her characterisation, resulting in someone you want to see on the screen more. The mixture of the nostalgia of seeing Max after all this time, a distressing day and a troubled home life while still trying to be positive make her stand out against all other characters. Despite some of her actions, Chloe is a character you can sympathise with. Far less one sided than some of the others in the game. The game is much better for her being in it. The overall quality of writing is good. The larger story is interesting and the town feels well realised. While some of the conversations are a chore to go through, they are only a small part of the narrative. The soundtrack is excellent and fits the atmosphere very well throughout. 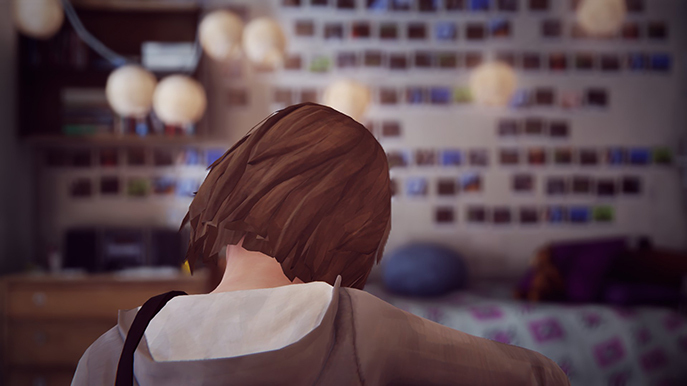 Another inconsistent aspect of Life is Strange is the visual fidelity. There are some absolutely beautiful scenes with excellent choreography and lighting – Max putting her earphones in in the college corridor and the diegetic sound fading out as it's replaced by the music as she walks along is one - but there are moments where everything feels flat. Some of the character's facial expressions don't match the tone of the conversation and some of the lip-syncing was out in some scenes. Both of this distract from the severity and sincerity of the narrative. And this is my problem with Life is Strange: Chrysalis. At some parts it is a wonderful and refreshing narrative-heavy experience and at others it's poorly written, tedious and underwhelming. It did do a great job setting up the two main characters and the arc for the overall series. Despite my reservations about parts of this introduction I'm very much looking forward to playing more and seeing how the narrative progresses. - Some of the dialogue is just awful – That photography lecture..
- Facial expressions don't match the tone of the conversation.